During the hot summer months, the last thing I want to do is bake desserts in a hot oven. 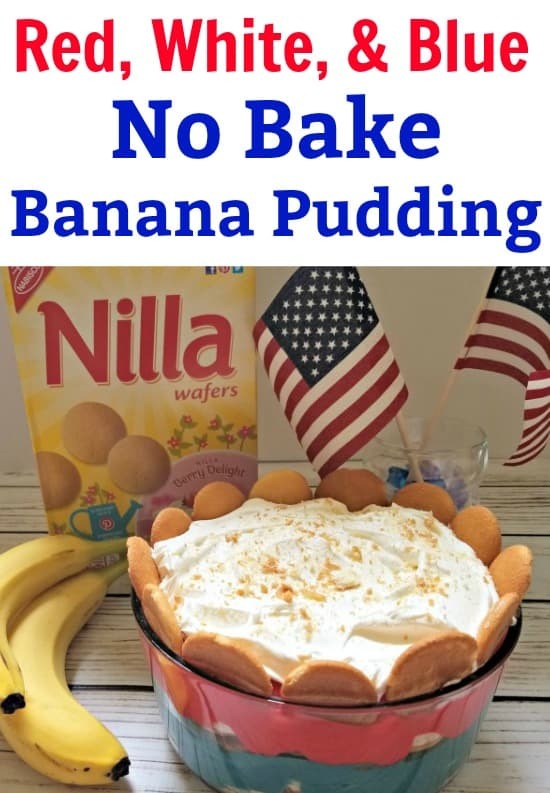 I love entertaining so I need some delicious no bake dessert ideas like this no bake Banana Pudding recipe that is perfect for Fourth of July. My family likes to get together for the Fourth of July to cookout and watch the fireworks. At any good Southern BBQ you have to have banana pudding for dessert! It’s a must have staple for my family. 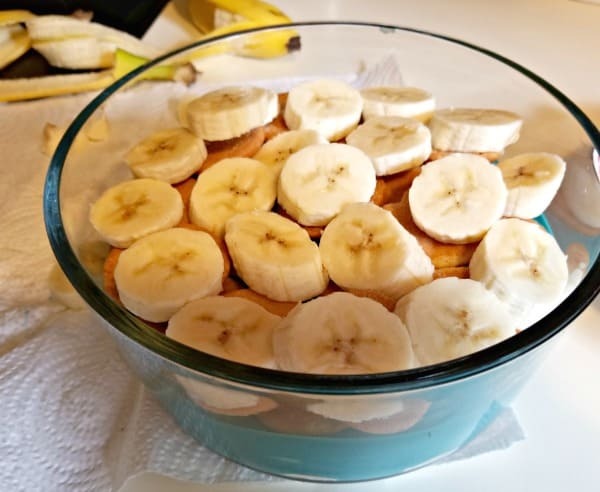 I wanted to share my family’s favorite no bake banana pudding recipe with you because it is so easy to make and there are never any left overs! This does make a very large bowl to feed a crowd so keep that in mind. If you will be having just a few people over for your summer BBQs or get togethers, you may want to just half the recipe. With my recipe I always use the original NILLA Wafers, never the store brand. It just makes such a difference in the flavor to me. NILLA Wafers are so versatile and are the perfect ingredient for no bake summer recipes. The possibilities really are endless. You can see even more no bake NILLA Wafers recipe ideas. I can grab all of the ingredients I need at my local Walmart. That makes this recipe even more easy and convenient. To make my no bake banana pudding more festive, I decided to use food coloring. You can feel free to leave it out for a regular looking banana pudding or switch out different colors for different holidays. It’s just something that I thought the kids would love, and boy was I right! Mix milk, vanilla pudding, sour Cream and 8oz (1/2) of the whipped topping with mixer for about 2 min. or until thickened. 2. 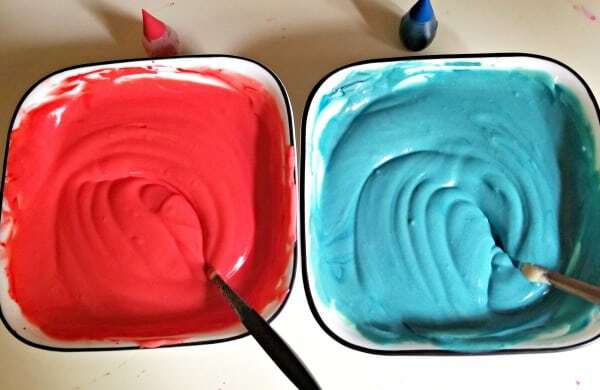 Divide mixture into two bowls and add red food coloring to one bowl and blue food coloring to the other and mix. Add more color as desired. 3. In the bottom of a large bowl, add a layer of NILLA Wafers, then a layer of bananas, then pour in the blue pudding mixture. 4. Add another layer of NILLA Wafers and then a layer of bananas. Pour in the red pudding mixture. 5. Top with the rest of the whipped topping. 6. Garnish with crumbled NILLA Wafers and line bowl with wafers. I did have to use the entire bottles of food coloring to get it the color that I was going for. I was pleased at how the colors were able to remain separated in the bowl for a festive look. The kids loved eating the pudding and my daughter particularly liked mixing the colors together so she could have purple pudding! 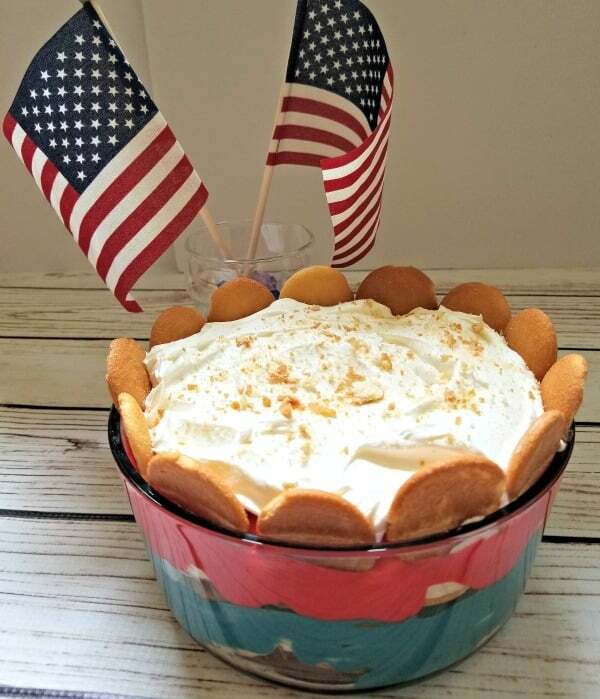 This no bake banana pudding recipe is such an easy way to please a crowd for Fourth of July! I love homemade recipes that are super easy! To help you prepare for your Fourth of July festivities, you can enter the NILLA Wafers at Walmart Sweepstakes to win a $200 Walmart Gift Card Grand Prize or one of 6 $50 Walmart Gift Card Prizes from May 15th- July 5th. This would be so cute to serve at the 4th! Great idea. This is so cute! I love your idea! Nilla Wafers are so good and so easy to use in no bake recipes!